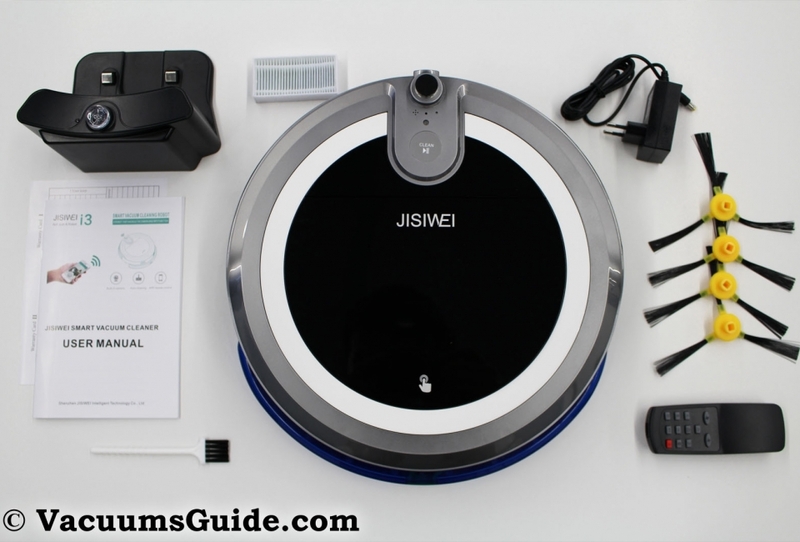 The Jisiwei I3 is the second robovac produced by this Chinese company. Having a good suction power and 2 strong side brushes, the I3 can tackle standard dust and debris with ease. With long lasting batteries and a fair dust capacity, this robot suits most households. As a bonus, the company maintained the camera on the front of the unit, and the smartphone app we see in their first product. The JISIWEI I3 gets most things off the floor with a maximum suction of 800 Pa. If you think about it, this is really a decent suction power. By comparison, this product has a suction almost equal to the one deployed by the iLife V5 Pro or by the iLife X5. Being mostly a bare floor cleaner, the JISIWEI I3 doesn’t have a brushroll, so the only agitation is performed by its 2 side brushes. Nevertheless, these are powerful enough to send most dirt towards the air intake. The rubber membrane which is surrounding the intake also helps focusing all the dirt inside the airflow. By the way, you need to untangle the hair off the side brushes every now and then. In Max mode the robot produces 61 db but if you are using it in the Standard mode, you’ll see that it is very quiet. The 3 hour charging process will give the I3 enough battery life to vacuum for 2 hours continuously, covering as much as 2100 sq. ft (200 sq. m). The 2200mAh Li-Ion batteries are more than decent, compared to the majority. They charge fast and store a lot. Compared to the previous version, there are more navigating options with the JISIWEI I3. Stairs and corners are tackle with its anti-collision TPU system and the 3 cliff sensors. In the Manual mode, you can use either the app or the remote control to command your robot. I had a lot of fun with the app, since you get to check to see where the machine goes with the built-in HD camera. There is a mode for Automatic cleaning, in which the robovac moves around the room on its own, semi-randomly. There is a mode for Spot cleaning which makes your machine clean in a spiral. The remote makes it easy to control. Aside from this, you can also put it in the Mop mode, once you install the microfiber accessory pad. You can also schedule it to do its job at a certain hour, but not on a specific day. You can also send the vac back to its base for recharging. If it manages to detect the infrared signal before it runs out of battery, it will reach the charging base on its own. 20 oz (600 ml) of dirt is what the bin can accommodate, and this is larger than iRobot’s 14 oz bin used in the latest Roomba 980. The process of emptying it is not that easy at first, and until you get the hang of it, you might want to do this outside. After a while though, it gets easier and you won’t really have a problem. I’ve showed you in the video how to detach the bin and to access the dirt. The water tank can accommodate 4 oz (120 ml) of liquid. I advise you to use plain water, with no detergent, as this part is not meant for scrubbing, it’s only thought for sweeping. Filtration is achieved with 2 filters. The standard filter retains most dirt inside the bin, while the HEPA holds airborne particles down to 0.3 microns. The package contains an additional HEPA filter, as these are not washable and need to be replaced after a few months. The product weights 5.7 lbs and measures 13.39 in diameter and 3.46 inches in height. These are pretty common dimensions. Besides the robot body which aleady comes equipped with the mop part, accessories include a user manual, an extra HEPA filter, two extra side brushes, a cleaning brush, a remote control that does not include AA batteries and a charging dock with adapter. a CCTV cam, which can film in HD. The 1.0 MP video sensor uses a 120 degree lens. the same smartphone app I was describing in the article about the Jisiwei S+. The Jisiwei software is compatible with the iPhone and Android devices. Connecting the app to your bot involves having to scan a QR code which you will find in the back of the unit. Set up your internet connection and then connect your robot to your WAN. Overall, you will probably find the app to be a great convenience. Options include sound share, image and video recording and motion alarm and detection. Even if you have a high speed internet connection, the app’s live streaming works best in the Smooth mode (rather than HD). You will see everything your vacuum sees and you can tele-operate and monitor your robovac wherever you want. The app uses 4G/3G or WIFI technology and you can control the unit anywhere, just with your smartphone. From hard floors to medium pile carpets, the JISIWEI I3 works on every type of surface. There is a relatively low noise produced by the unit at around 55 decibels (in the Standard mode). On the robot case there is a simple touch button. The voice notifications are funny (at least at first). You will need to configure the app, but this is not going to be too hard to manage. It took me around half an hour to set up everything. After a few minutes of getting stuck, the unit shuts off automatically, as to protect both the battery and your home. There is a one year warranty that comes with this product. As usual, each wholesaler superimposes its own warranty policies. You can get this unit for less here, by using the coupon code JISIWEI3. By the way, if you want to shop for other things in the Home & Garden department from GearBest, use the coupon code HOME15OFF and get 15% off. You can also find this product on Amazon. Most people have no regrets buying this product, since it works both as a robotic vacuum cleaner and as a mobile surveillance system for your home. You can actually get one either for the cleaning purpose, or to use it for checking sensitive spaces. In essence, you are buying two products in one: a home surveillance system and a house cleaner that works well. The I3 has a powerful suction and a strong motor. The remote control makes everything so handy. The Automatic mode allows the vac to clean, charge itself and clean again. Your selections are confirmed by a voice prompt. Filtration is HEPA grade, and you also have the option for wet mop your hard floors. And of course, one of the most important PRO is the price. What do you think about the I3? Would you invest in this Jisiwei?